SUAKOKO, LIBERIA - OCTOBER 17, 2014: James McGill Kiamue, 23, who works as a hygienist and sprayer, from Bong County, a student of Cuttington University who was studying Biology before Ebola closed down Universities and schools across the country and disrupted his studies, stands for a portrait at the Bong County Ebola Treatment centre on October 17, 2014 in Bong County, Liberia. 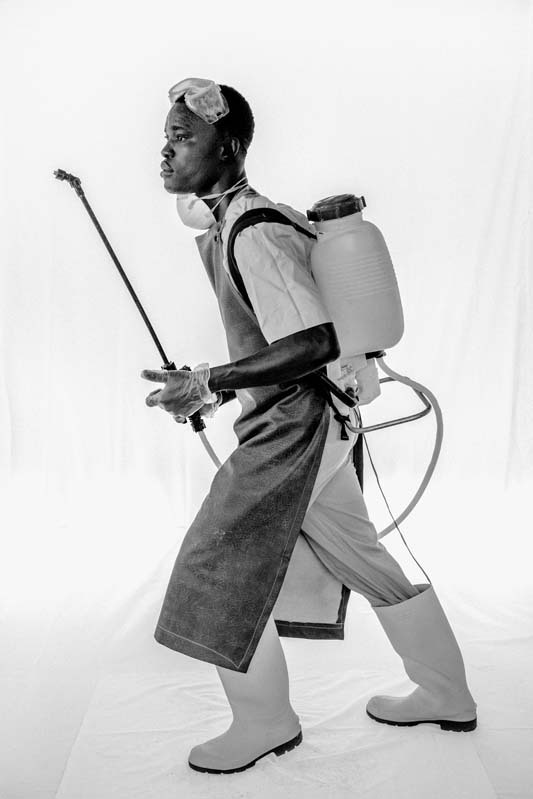 "My mother was afraid for me to come to the Ebola center. She was panicked. I said, 'Mommy, if we all sit back and no one volunteers to fight Ebola, what would it be like in Liberia? We're going to die from the virus. You can die from Ebola, I can die from Ebola, my sister can die from Ebola, and even my daddy. It is better that we volunteer ourselves to be trained and combat the virus.' She got convinced, and she allowed me. But all the time, she tells me I should be careful." Mr. Kiamue sprays bleach inside the high-risk areas, including patient rooms, the garbage and the toilet. He also sprays corpses and accompanies the burial team. Before the outbreak, he was studying biology and chemistry at a university. He is planning to marry and hopes to become a doctor.